There was really no better time for Samantha Bee to get her own late-night show than during a presidential election year. 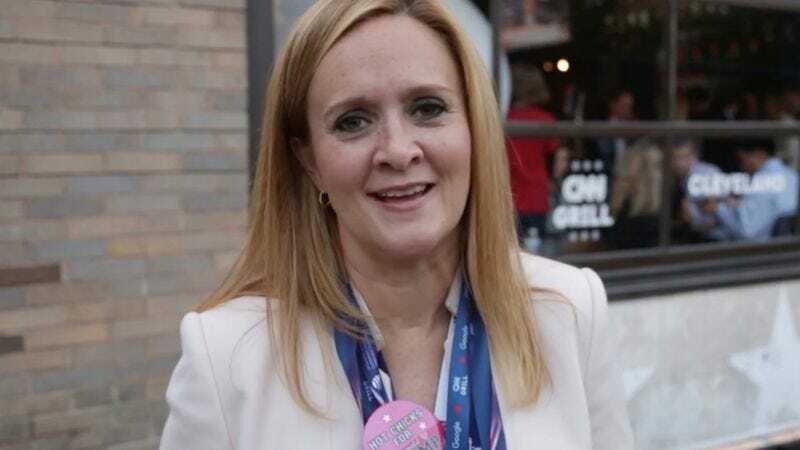 The political circus remains firmly in the Full Frontal host and Daily Show alum’s wheelhouse, which is why, despite being on a weekly show, there was no way she was going to be left out of the Republican National Convention. Bee hit the road with some of her writers to talk with the “real” Americans who are voting for Donald Trump, Hillary Clinton, as well as those who haven’t given up the good ship Sanders. After repurposing former presidential hopeful Herman Cain’s campaign bus for their needs, Bee and her staff hit a few bumps in the road, including spontaneous combustion and one very undecided voter. The trip isn’t quite the bonding experience the host hoped for, but just when things look their bleakest, Tony “President Fitz Grant” Goldwyn gives Bee the pep talk we’re all shouting at her onscreen. If only everyone on their way to Cleveland could get that kind of boost.